Foot Cardigan vs. Say it with a Sock: the best sock of the month club? A sock of the month club subscription makes a great gift and also a nice personal add-on for anyone who needs an easy way to ensure their sock drawer stays up to date and sharp. For those of us who are human, you likely lose your socks on a regular basis for unknown reasons, so of course a sock subscription alleviates the lost sock problem. Sock of the month clubs are here to stay in the era of subscription commerce, and today we are going to compare Say it With a Sock and Foot Cardigan, two of the more popular sock of the month clubs. Foot Cardigan is a sock subscription known for their humor. For podcast listeners, subscribe to their “Footsies Podcast” hosted by the Foot Cardigan founders. Their socks are made under the Foot Cardigan brand and come in variety of patterns and designs for all ages and genders. On the other hand, Say it with a Sock is a fun sock of the month club that lets you select between a style of patterns, graphics, or a mix in each sock shipment. 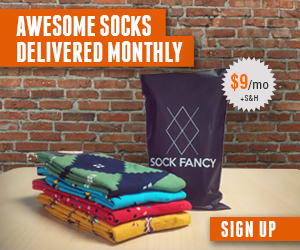 With Foot Cardigan, you receive a new pair of socks each month. They allow you to choose which pair you receive prior to each shipment. Comparatively, Say it with a Sock gives you the choice of receiving 1 pair, 2 pair, or 3 pairs of socks each month in your package. The pricing for Foot Cardigan is a simple $9 per month, and for $2 more each shipment can be gift wrapped. They offer free shipping, and by paying in advance you can save money and receive a free month with a year prepaid upfront. Say it with a Sock prices start at $11.99 per month for 1 pair of socks, and then it’s $8 to add a second pair or $14 to add two more pairs each month. With Say it with a Sock, you can pay in advance to save money. Both Say it with a Sock and Foot Cardigan are positively reviewed by their customer base. The Say it with a Sock website posts reviews, and as of today they are showing 696 reviews and an average rating of 4.5 out of 5 stars. Foot Cardigan has received coverage in major publications such as BuzzFeed, The New York Times, Good Morning America, Shark Tank, and Forbes. So which sock of the month club is better — Foot Cardigan or Say it with a Sock? Since so many people wear socks, we’ll leave the verdict up to the wisdom of the crowd. In the meantime, give them a try and let us know what you think in the comments!